This advice can be incorporated into any of the other training sessions. 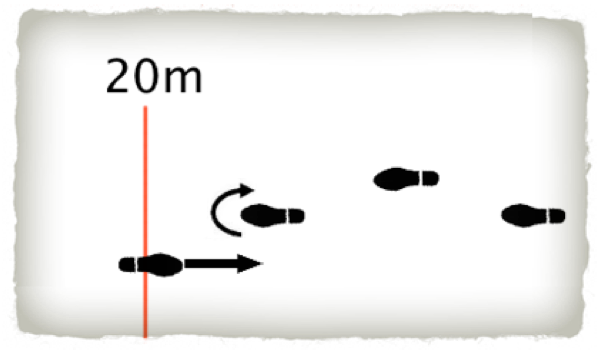 This is the technique for optimum turns during the multi-stage fitness test. This technique alone will boost your score a few shuttles without any actual fitness improvement. Many people do not consider the turn during the beep test as very important. To illustrate just how important it is, consider a racing car driver. The specific techniques applied during turns are the main factor that separates the world- class drivers from the rest. Whilst you are not in a vehicle, the way you move your body is critical to maximising your economy of effort. Additionally, just like a race car driver, your approach to each turn is the most important stage. The simplest explantation for correct turn technique is that you must turn before you change direction. In other words, your last step is actually a ‘back step’ on to the 20 metre line. Therefore you start your turn on the second last step you make before the turn line. Then on your last step, you are already facing back the other way. Your foot is now pointed the direction you are about to start running. This makes it much more fluid and natural to ‘bounce’ back to the next shuttle. Your head position will help you to guide this motion. Turning your head back to the other end will bring your body and feet naturally around with you. The diagrams below demonstrate examples of a poor technique and a great technique. You are literally running a metre less at each end by using this technique. 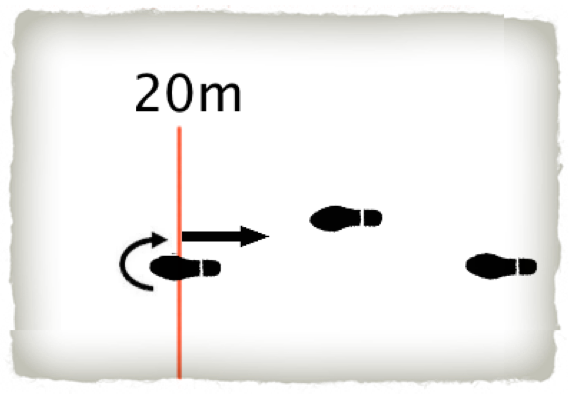 Make sure you still take the ‘back step’ to hit the 20 metre line! Poor Technique: 180 degree turn on last footstep on the line. Great Technique: 180 degree turn with second last footstep. Last step hits the 20m line already facing back in the new direction. This is an extract from the Police Mastery eBook series. You can find out more about your specific state preparation at our ‘Training Products’ link.